Chrysoberyl means golden beryl (Greek) with beryllium aluminium oxide chemical formula (not a silicate as is beryl). It is the third hardest mineral after diamond and corundum with hardness of 8.5 in Moh’s scale. Chrysoberyl crystallises in the orthorhombic system. Simple crystals are rare, but fine trillings or twinned crystals, which appear hexagonal at first glance, are found in Brazil and the Ural Mountains. The Chrysoberyl family consists of three very different gemstones which are among the world’s rarest varieties. Chrysoberyl varieties include the famous transparent color-changing alexandrite, the Chrysoberyl cat’s-eye, and fine transparent gemstones of yellow, green, brown or colorless. These colors are caused by small amounts of iron or chromium. Chrysoberyl gemstones have the same inclusion as corundum: fine rutile needles all pointing to the same direction. Inclusions also consist of fingerprints and parallel lines of repeating twins. Alexandrite: Alexandrite is one of the world’s rarest gemstones. Alexandrite is famous for its dramatic color change from deep green in daylight to red in tungsten light. This changing color is called alexandrite effect. For this effect, sometimes alexandrite is referred as “emerald by day and ruby by night”. In addition to the changing of color with different lighting conditions, alexandrite is remarkably pleochroic which means it can appear red, orange-yellow and green in different directions. Alexandrite was discovered in 1830 in emerald mines of Ural Mountains. The gemstone was named after the Russian czar Alexander II and it was the national stone of czarist Russia. The largest cut alexandrite weighs 66ct and is in the Smithsonian Institution in Washington. Sri Lanka, Brazil, Russia (the deposits in the Urals are worked out), and Southern Tanzania are the main sources of alexandrite gemstone. There is also a rare cat’s-eye form of alexandrite (cat’s-eye alexandrite) which shows both color change and chatoyancy. Cat’s-eye alexandrite is extremely rare. Because of chatoyancy, this gemstone is finished as cabochons rather than as faceted gemstones. Chrysoberyl cat’s-eye: Chrysoberyl cat’s-eye was first noted in 1910. This gemstone also called cymophane which is Greek for “waving light” referring to the optical effect cause by rutile needle inclusions. These parallel inclusions produce a silver-white line which appears as moving light ray in a cabochon-cut gemstone (this cat’s-eye effect moves side to side when the gemstone is rotated). The gemstone’s color change from honey yellow and honey brown to yellowish green and nearly bright green. The yellow color is due to presence of small amounts of iron in the composition of the gemstone. The most attractive color for the gemstone is a light golden brown with a darker shadow that produces the gemstone’s “milk and honey” or cat’s-eye effect. 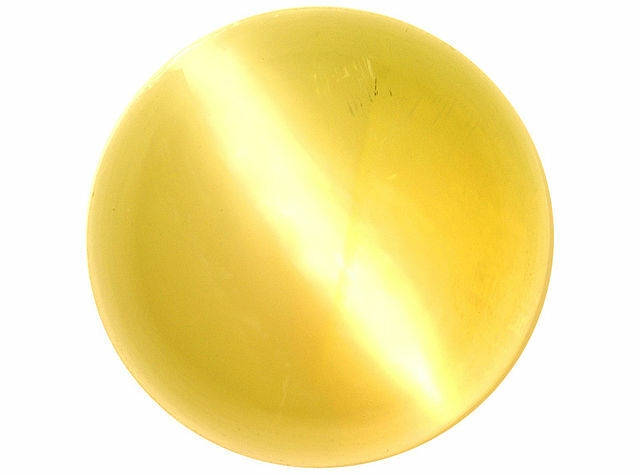 Sri Lanka, Brazil, and China are the main source for Chrysoberyl cat’s-eye. At the end it is worth noting that Chrysoberyl cat’s-eye can easily be confused with quartz cat’s-eye.